It is fair to say that nothing in life is absolutely certain. We always assume that certain things are going to be there when we need them. Things like food, water, shelter, basic needs that have always been provided to us. What happens when one of those is wrenched away though? What are you going to do in such a scenario? Many of us would have difficulty answering that question. There’s a fine line between being prepared and being paranoid, as many of us are aware. 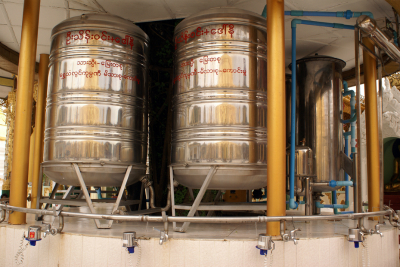 One thing that has never been in question however, is the need for water storage tanks. These come in portable options, underground versions, and various sizes. They are used around the world and have been since the beginnings of civilization. Why are these so widely accepted and utilized? Water storage is our greatest defense against emergencies, droughts, or any other situations where water could become scarce. Let’s assume that you currently don’t have a water storage or water capture system installed. You are entirely dependent on water that comes from a government regulated source. City water as it is commonly referred to. There are varying levels of quality to this water for drinking, so you have a separate water filter, or one installed in your sink, to ensure that the water is clean and safe to drink. You take showers with it, you wash your car with it, and you even water your garden outside with this city water. There’s nothing fundamentally wrong with it, but all of this water use adds up each month to a lovely bill that eats into your budget. You’ve heard that there are other options, but you haven’t seen any so you continue paying exorbitant amounts of money for water each month. It doesn’t stop there though, because construction one week left you without any water in your house for eight hours each day. You were forced to spend even more money buying jugs of water for drinking purposes. There has to be a better way. You hear about other people using underground storage tanks, and you also hear about rainwater harvesting systems that allow people to have a constant supply of water for all manner of purposes. Having finally become exhausted with the cost and hassle of city water, you decide to look into it. Now that we’ve outlined the very real scenario above, it’s time to see how your life has changed since you decided to purchase and install an underground water storage and rainwater harvesting solution from FreeWater Systems. Our patented OcTank provides you with a unique polyethylene design that consists of individual modules fastened together into a single monolithic tank. This design was patented in 1994 and since then we have continued to innovate and expand upon the concepts of water storage. Our tanks are current in use all across North America and in the Caribbean. By incorporating a water harvesting system, you can store enough water to become fully independent of city supplied water and all of the downfalls that come with it. We want you to have access to your water when you want it and when you need it. A water storage tank will make that a reality for you. You will instantly notice yourself saving money as well since you no longer have to pay for water each month that is supplied to you by the city. Your life changes drastically and when the city shuts off the water for whatever reason they decided on that day, you can continue living your life exactly as you did before, with the peace of mind that you will never be without water when you need it. If you like the sound of this radical life altering decision, the process is really quite simple. Visit us on the FreeWater Systems website and allow us to provide you with more information. Craig’s life has changed for the better, and yours can too. Don’t hesitate while city water continues to damage your budget and your overall quality of life. Choose an underground water storage solution and see how much it can change your life for the better.